Aside from being really tasty, these noodles make for a quick and easy meal. I live for these kind of meals, BTW! All I did was spiralize a large sweet potato with my awesome spiralizer, toss the "noodles" in a skillet with some kale for a few minutes. I topped it with my fave tahini dressing and called it a day. This is a MUST TRY, you guys. Trust me, you will not regret it! Sprouts has a lot of other awesome items on sale right now (35% off through April!!) for their #BetterForYouBrand event. You don't need a coupon or code, just head to your local Sprouts Market! Find more sweet savings here! Sprouts also has a super awesome giveaway going on right now! It's called the Get and Give Back Sweepstakes, where FIVE lucky winners will be picked to receive a $2,000 gift card to Sprouts and will also get to nominate a local food bank in their community to also receive a $2,000 donation! SO AWESOME. *Thank you to Small Planet Foods for sponsoring today's post and for inspiring me to try better-for-you recipes! 1. Add olive oil to a medium skillet. Bring to medium heat. 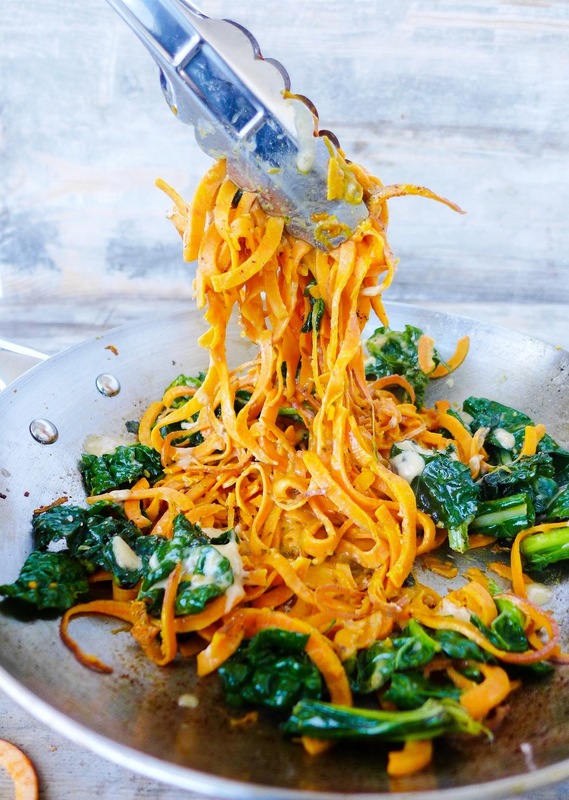 Add sweet potato noodles and cook for 6-7 minutes, adding kale half way through. Stir the noodles often while cooking using tongs.2. Remove noodles from heat. Mix in the Goddess dressing. If it is too thick add in some water. Season generously with salt and pepper. Top with cilantro (or other herbs of choice) and avocado. Serve immediately.